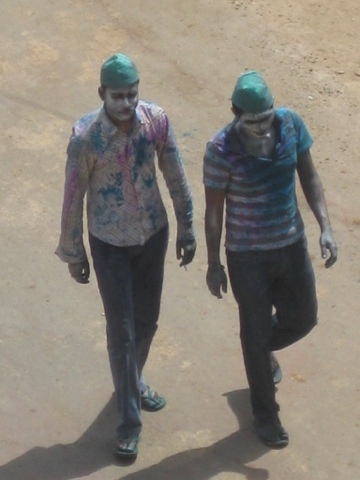 It is great to be a boy on Holi. 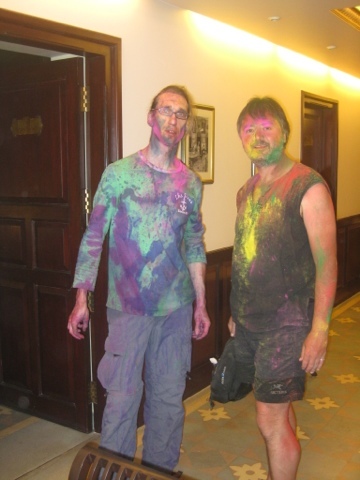 Oh sure, Holi is for everyone, but it is hard to imagine anyone enjoying more than young boys the freedom to spray complete strangers with colored water–even using high-powered squirt guns–and throw colored powders at them! It is definitely a day for boys–young and old. Here’s the background. 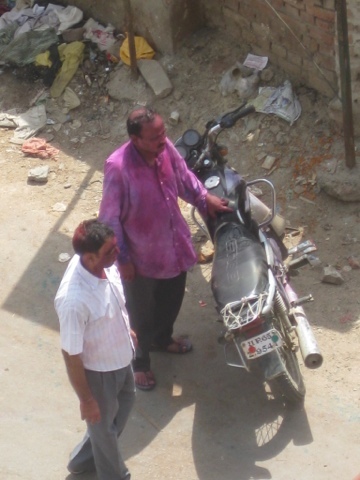 Holi is one of the most popular festivals in all of India, and it is celebrated everywhere with great gusto. It is a great celebration of spring, and not the most overtly-religious holiday in Hinduism by a long shot! However, it does have a variety of myths and traditions behind it–one of which has to do with my dear Krishna. The story is told that one day he was complaining to his mother that his skin was dark and his beloved Radhu had such fine pale skin. His mother told him that if it bother him, he should rub colored paste on her–playfully, of course–to darken her skin. This he did, and from this childish prank, a festival was born. This legend means that Holi is celebrated with particular enthusiasm and verve around Mathura and Vrindivan–Krishna’s birthplace and the place where he spent his childhood. Another story has to do with the triumph of good over evil. It is said that once there was a very wicked king [Indian mythology is full of wicked kings–foils for the good deeds of gods and their devotees] who demanded that everyone in the kingdom worship him. The irony is that the one who defied his command was his own son, Prahlad, who became a great worshipper of Lord Narayana (Vishnu). This infuriated the king, who instructed his wicked sister, Holika, to taken Prahlad onto her lap and step into a giant fire. The king knew that she had received a boon, and would escape the fire unharmed, while Prahlad would be destroyed. She received just payment for her wickedness: unknown to her, the boon was only valid if she entered a fire by herself–it was ineffective if she went in with another person. Thus, she was immolated, but Prahlad, who chanted the name of Lord Narayana the whole time, came out unscathed. 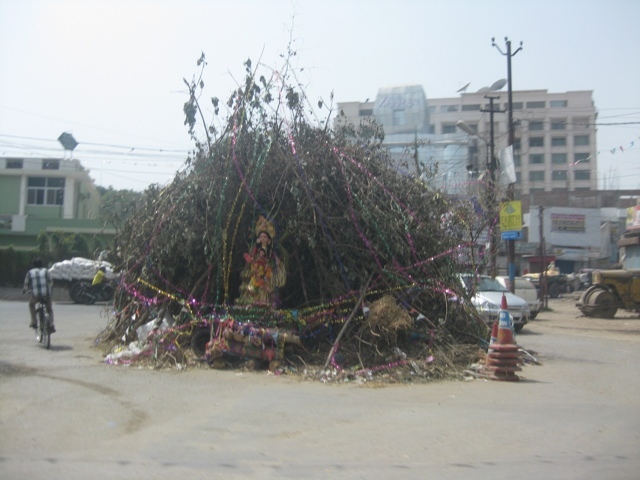 The festival thus takes its name from her name, Holika, and celebrates both the downfall of wickedness and also the faithfulness of devotion. [Although, honestly, I’m not sure how much either one of those things is actually in evidence today as part of the celebration]. Anyway, the most obvious reminder of this story comes in the large piles of wood that are gathered at various points in cities and villages–sometimes right in the middle of the road. 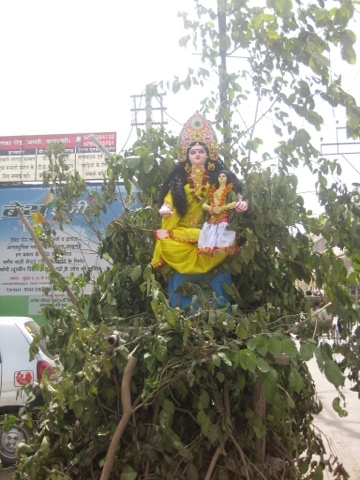 In them are placed small images of Holika and Prahlad. 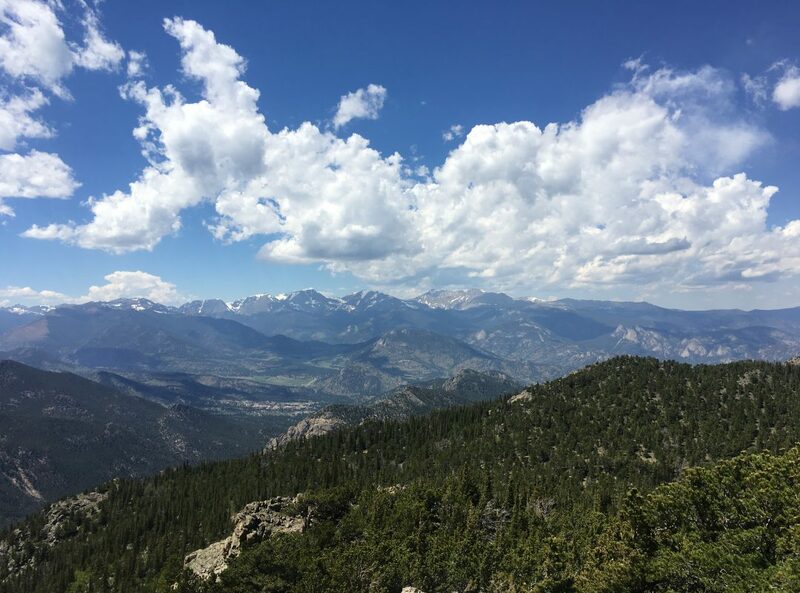 (Two picture of that are below). On Holi eve, after much singing and dancing to Bollywood Holi songs–played over loudspeakers–bonfires are lit and the whole pile is reduced to ashes. And from then on, it is chaos! 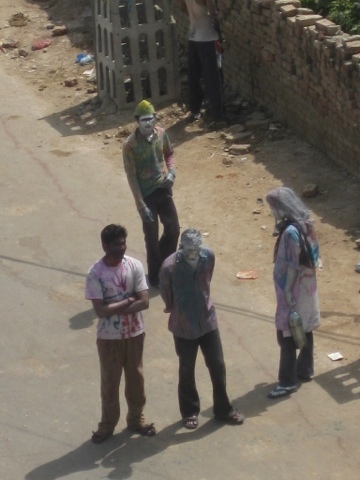 So, waking up this morning, I knew it was Holi, and I knew of this practice of throwing colored water and pastes. However, I planned to go out anyway–to my little cafe for breakfast and to visit a temple or two. “Surely, life still goes on,” I thought; and what would be the harm of getting a little wet or a little colored. Everyone who knows me knows I love color! The staff at the hotel were concerned, however, and tried to tell me not to go out; but I was insistent and so they unlocked the door [yes, they keep the door locked today] and off I went. I wasn’t out very long before I realized the wisdom of their advice. 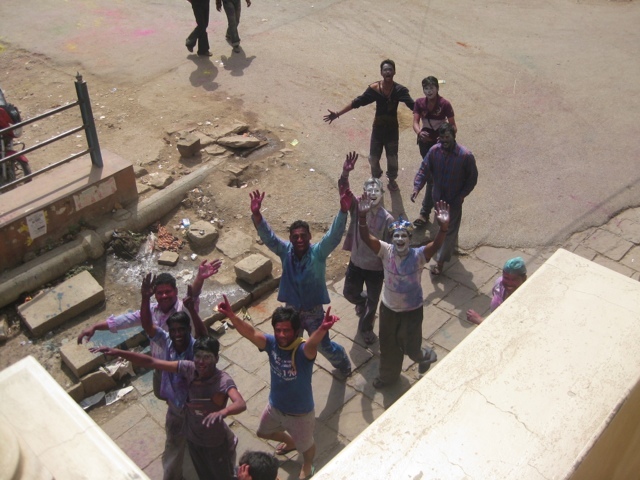 Yes, I got hit with colored water, and yes, it was no big deal–people overall were happy and the joking was playful. However, what I quickly realized was that the only people on the streets were boys of all ages [see above], and most things were closed–including my little cafe, which closed yesterday at 4:00 pm, to be safe, and won’t re-open until 11:00 am tomorrow! I didn’t see any women walking around at all, and I decided I probably should beat a hasty retreat back to my hotel. The streets were full of men riding around on motorcycles, every inch vibrant with shades of pink, green, blue and yellow, and groups of guys walking around with brightly colored foil hats, and faces painted metallic silver. Previous: Previous post: Oops–the Mulgandha Kuti Vihar Temple! Next: Next post: Feeling Good in Chennai!